Last weekend I had the pleasure of visiting my friend and first real Peak Oil influence, Dr. Jerry Unruh. Jerry and I did a bit of mountain climbing, some snowshoeing, watched An Inconvenient Truth (I also read the book while I was there) and spent a lot of time talking about Peak Oil, Global Warming, sustainability, and many other topics. I took a lot of notes as we talked, because we hit on many topics that are often discussed here and at The Oil Drum. First of all, let me introduce Jerry. He is a Ph.D. chemist that I met 11 years ago when we both worked on butanol research and technical support for Celanese Chemicals. While I was certainly aware of Peak Oil (I had mentioned it in my graduate thesis), Jerry was the first person who convinced me that the smooth transition to biofuels that I envisioned at that time was highly questionable, and that things might not turn out so well. Jerry is also the father of Ana Unruh Cohen, the Director of Environmental Policy at the Center for American Progress. Ana previously wrote a guest essay on Prop 87 here. Jerry makes around 300 contacts a year with government officials (congress, federal agencies, etc.) in his role as an advocate. Jerry is a member of the Union of Concerned Scientists, Natural Resources Defense Council, National Audubon Society, Wilderness Society, American Solar Energy Society, and a supporter of Worldwatch. He is also a member of the Technical Advisory Group for Colorado Springs Utilities which is tasked with looking at renewables and demand-side management. 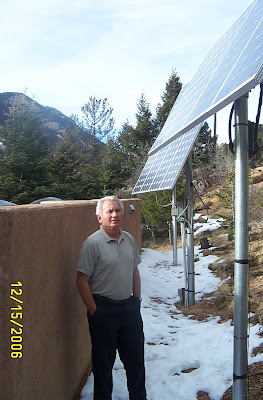 He lives in a solar rammed earth tire house (pictures can be seen here) in the Rocky Mountains west of Colorado Springs with his wife Diana. Jerry is denoted in this essay as JU and I am obviously RR. If you want to discuss energy or environmental issues with Jerry (he especially likes to talk about his experiences with solar energy) he can be contacted at jerryunruh42 at msn.com. RR: Jerry, you are probably aware that you were my first major Peak Oil influence. You asked me what we were going to do when oil production peaks, and I remember naively saying “Switch to ethanol.” You laughed over that. JU: Yeah, I remember that. RR: So, when is world oil production going to peak? JU: We may be at peak right now, but I would say definitely within 10 years. RR: So, what will the world look like 30 years from now? JU: If we used wisdom, we could potentially transition from fossil fuels. We could have more livable cities, public transports, electricity from renewable sources powering PHEVs, and household electricity being produced by a combination of solar power and stationary hydrogen. However, it is not clear that we have the wisdom, in which case I see more wars and widespread starvation. RR: Speaking of wars, tell me your views of the Iraq War. JU: I get so upset talking about it. I was against it before we ever went in, but look at where we are now. All of those lives lost and all of that money spent on securing oil supplies. The recently released Iraq Study Group Report suggested that this war may ultimately cost $2 trillion. $2 trillion! Do you know what could have been done with $2 trillion? You could have put solar panels on 40% of the homes in the U.S. Imagine the greenhouse gas reduction from that. Imagine the energy security. Instead, we spent it to go to war to protect our oil supplies. RR: How do you think the U.S. will fare after peak oil? RR: Jim Kunstler made that same case in The Long Emergency – that the Northeast was better positioned than most places, and that the West is in trouble. By the way, have you read Kunstler? JU: No, not yet. But he is on my list. RR: You also believe that some sort of hydrogen economy can supplement solar? JU: Not a hydrogen economy as it is often presented. I don’t believe that we will drive around in hydrogen fuel cell vehicles. But I believe that excess solar can be used to electrolyze water and produce hydrogen, and then that hydrogen can be used to produce supplemental electricity in a combined-cycle turbine. The electricity produced can be used to run PHEVs. RR: I am also a big fan of the potential of PHEVs driven by wind and solar power, but hadn’t thought much about a hydrogen tie-in. That would actually be a great way to supply some electricity at night. But do you think solar is practical for everyone, given the implications of people operating their own electrical systems and having to maintain their own batteries? JU: Ideally, you would have local distribution stations in which the solar power was fed into by the homes in the region. This would also be where the hydrogen was produced. The local stations would be responsible for maintaining the integrity of the system. RR: I hear what you are saying, and agree that this would do wonders for both Global Warming and Peak Oil mitigation. But then I think back to the comments I made about Al Gore after we watched An Inconvenient Truth. The facts may be incontrovertible. The logic may be crystal clear. The solution may be staring us right in the face. Now, trace out the path for implementing the plan. That is the disconnect I see here. You listen to Al Gore and you think “It is obvious that something must be done.” But I look at the politics and wonder how we will get it done. JU: There are solutions, and some are relatively clear. But again I am not sure we have the collective wisdom to make the transition. RR: I have a bit of a love-hate relationship with the potential for biomass to mitigate peak oil and global warming. On the one hand, I love the potential of biomass gasification, and I think biodiesel and potentially butanol make sense in some situations. On the other hand, I have great concerns over what we are doing with corn ethanol in this country. However, you have a different take on the biomass issue. JU: Here is my problem with biomass. The net primary productivity of some of the most efficient ecological systems in the world is at best approximately 1% capture of solar insolation. Many areas – the forested regions of the West, for instance – are much lower at 0.2% or so. Corn is about 0.5%, but that includes fossil fuel inputs from fertilizers, pesticides, irrigation, etc. Of course then if you are going to turn that biomass into biofuels, there are inputs into that process that lower the net capture. While there may be some limited applications in which such poor efficiencies are justified, in general this is a very inefficient way of capturing solar energy. Contrast this with our solar panels, which convert approximately 15% of the sun’s energy into electricity. That is orders of magnitude better than the biomass route. We have numerous rooftops that could have solar panels setting on top of them. There are no issues with soil depletion, and we don’t have to worry about planting great swaths of monoculture crops, nor of food competing with fuel. Of course with biomass you can produce a liquid fuel instead of electricity, but there is simply no reason that we can’t adopt much higher levels of PHEVs instead of continuing to rely on the internal combustion engine as our primary means of transport. And note that this is with present commercial solar technology. Spectrolab just produced some solar cells with an efficiency of over 40%. Biomass simply can’t compete with numbers like that, and it never will. RR: OK, there are definitely some points there that I haven’t considered. The net primary productivity argument, specifically. While I have heard passing mention of this, I have never set out to calculate the potential of biomass from first principles like net primary productivity. Sounds like something I should work on, because this would be a pretty strong argument against biomass and in favor of solar energy. RR: So, first of all I have to know if Ana (Jerry’s daughter, and a supporter of Prop 87) is ticked off at me over my Prop 87 essays. RR: You can’t imagine how often I get that reaction. A lot of people are willing to completely dismiss my opinion because I work for an oil company. JU: No, I can believe that. The same thing frequently happened to me when I worked for a chemical company. RR: What really bugs me is that people are so incredibly dependent on petroleum for so many things, and they loathe the companies supplying that product to them. JU: Of course most people are unaware of the extent of their dependence on petroleum. Look at the clothes we are wearing. They came from oil. Look at the snowshoes we are wearing. They came from oil. But people feel that when ExxonMobil is making $37 billion and they are paying $3/gallon for gasoline – which should be $5/gallon in my opinion anyway – that something needs to be done about that. Those profits simply look ridiculous. RR: But you know that our profit margins are only about average for all industries. We make about 10% on sales. Profits are high because the companies are huge. JU: It doesn’t matter. Your profit margins could be 2% or 20%. The perception people have is that they are being cheated, and those are the consequences you will have to live with as they lobby their representatives for relief. RR: That’s on my mind a lot, actually. I have been investing a lot of my money into energy, because I think it will do well even in a post-peak world. People will still demand energy, and it is going to be very expensive. Oil companies should do well. But what is the government going to do when gasoline is $6/gallon, and ExxonMobil makes $100 billion? There is a risk there, and I imagine government is going to be very hostile to Big Oil in a post-peak world. JU: One of the reasons for your public relations problem is that oil companies have been too cozy with this administration. Look at Cheney’s energy task force. They wouldn’t release the proceedings. This leaves the impression that Big Oil is getting special favors and benefiting from closed-door deals. What you really need to do is be proactive. If you guys would get behind a revenue-neutral fossil fuels tax – and I don’t mean just pay lip service to the idea – then people might start to think you were serious about dealing with issues like Peak Oil and climate change. You (personally) say the right things. Your ideals are good. But those of your industry are questionable. You could also give up some of those subsidies. Do you really need subsidies? RR: I agree that oil companies don’t need subsidies. In fact, 4 out of the 5 CEOs who testified after Katrina said that they don’t need subsidies. But I want to point out a couple of things. First, eliminating the direct subsidies would amount to only a nickel a gallon or so. Those subsidies spread across all of the diesel and gasoline we use amount to very little per gallon. I am not defending the subsidies, I am just saying that the effect will be small and more needs to be done like a direct fossil-fuels tax. But the other thing is that oil companies have not even requested some of these subsidies. Some subsidies are put in place because congress wants the oil companies to do certain things; things like drill in a particular location. So, even though oil companies might never even take advantage of this, it gets counted as a subsidy. JU: Again, it doesn’t matter. It would improve public perception if you were to publicly announce that you were giving up all subsidies. Besides that, $6 billion or $10 billion might not mean much to Big Oil, but if those subsidies were redirected to alternatives, it could really accelerate their market penetration. In fact, just getting rid of the oil subsidies would level the playing field for alternatives and allow them to compete head to head with oil. Right now it appears to the public that the government is in collusion with Big Oil. If you want to change this perception, and the perception that people have of Big Oil, you need to make some serious policy changes. You can only do this by being very serious about solving some of these major issues facing us. Whitewashing will not do it. RR: I do believe that those who think that Big Oil is going to fade away after oil production peaks are kidding themselves. They have enough cash on hand to get into any energy business that looks promising. I note that 2 of your solar panels were produced by Shell Solar. JU: I think companies like Shell and BP – despite their recent problems – are positioning themselves to be leaders as oil production depletes. ExxonMobil just doesn’t seem to care, and could end up going the way of General Motors. RR: Speaking of the government and Big Oil, what do you think the new Democratic congress is going to do differently? JU: Well, first off I think there will be less pressure to drill in environmentally sensitive locations. I think we have a real shot at some climate change legislation, but I also expect Bush to start using his veto power with more regularity. I hope to see higher efficiency standards, higher CAFE standards, and more support for renewables. One wild card is the greenhouse gas case before the Supreme Court. It appears to me that the language is clear that the EPA could and should regulate GHGs. I am cautiously optimistic that the Supreme Court will vote in favor, and this could make a real impact in our fight against Global Warming. The final section contains information that Jerry put together on their house. Again, feel free to contact Jerry for more detailed information. Footprint = 2350 sq ft; Actual floor space = 1950 sq ft.
950 tires (225x75x15) packed with decomposed granite from site. Total of about 750,000 lbs of dirt used in tires and for interior adobe walls. Framing: 2×6 studs with double studding in east and west walls and above tire shell. Roof: Standing seam metal roof with ice and water shield underneath; 1to12 pitch. Insulation: R-38 in ceiling; R-42 in side walls, R-26 in rear wall. Windows: double pane with 6 operable 3.5’X2’ windows; total window area on South-facing side of house is approximately 410 sq ft.
Skylights: four operable 4’X4’, and one operable 2’X2’. Floor: ceramic tile for heat absorption. All electricity is from photovoltaics (1.52 kW) with energy storage in batteries (twelve 350 amp-hr; 1,050 amp-hr storage at 24 volts). The system is 24 volts with all electricity being converted to ac via a Trace 4024 inverter. All lighting is compact fluorescent bulbs. The refrigerator (main power consumer) is a 21 cu ft energy star Amana. Otherwise all electrical devices are conventional, but we turn off “phantom” loads when necessary. In order to run the 240 volt well pump we have a transformer which is wired directly to the float switch on the 500 gallon spherical cistern so that the transformer is only on when the well pump is running. Our average consumption is approximately 5.0 kWh/day. No generator -Backup is from the grid. In almost 6 years we have used only 71 kWh from the grid (most of this consumption has been around the Christmas/New Years holidays when the children and their families have been here). Other than the supplemental heating stove, propane is used to heat water, cook, and dry clothes: Water heater – Aquastar 125X LP tankless (on demand); Range – GE profile; Clothes dryer – Frigidaire LP. Propane consumption for these three appliances is ~ 0.35 gallon/day (125 gallons/year), of which about 0.15 gallon/day is for water heating. New addition: Single point electric water heater under kitchen sink; so either electricity (~0.5 kWh/day) or propane can be used. Our house approaches net zero energy, when electrical production is subtracted from propane consumption. Our net propane consumption is approximately 0.4 gal/day (gross is 0.923 gal/day). Our net carbon dioxide production is approximately 1.5 kg/day while the average household production in Colorado Springs is > 40kg/day. We plan to reduce heat loss from windows with translucent coverings so that net zero energy is more closely approached. Our net household energy consumption is approximately 0.75 Btu/sq ft-hr. For comparison, the maximum energy consumption for an ultra low energy commercial building designation from LEED is 3.4 Btu/sq ft-hr. What is the difference, if all energy sources presented at the chart, use same measurement units? And that falling curve in the present would not change it’s direction, nor it’s angle towards the axis. Solar Energy Even if we turn to cost of electricity as a method of comparison, I doubt it we would see much of a change.